How Much Protein, Carbohydrate and Fat Do You Need? Normally, when you think about building muscle, you think protein. But that shouldn't be the only thing on your plate. Q: I'm trying to put together the best possible mass-gaining meal plan. Where should I start? A: Normally, when you think about building muscle, you think protein. But Mike Francois, past winner of the Arnold Classic, knows that shouldn't be the only thing on your plate. Mass-building requires energy, through high carbohydrate intake. "To gain mass, you have to ensure you're getting enough protein to rebuild muscle tissue damaged through training, but you also have to eat a lot of carbohydrates because gaining size requires you to fill your muscles with glycogen," he says. Glycogen is the collection of carbohydrates stored in muscles that powers your training and affects anabolism; think of it as an energy stockpile. To maintain that supply as you're trying to gain muscle, you need a slight positive intake in carbohydrates at each meal -- that is, you have to eat more carbohydrates than you burn. What does Mike consider an ideal meal? 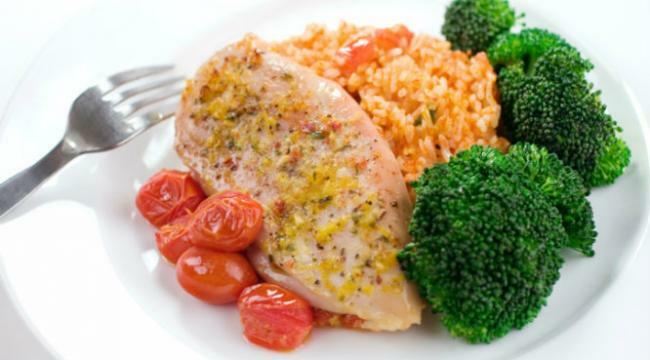 "For someone who is training hard and weighs over 200 pounds, I'd suggest 6-8 ounces of chicken breast, 2 cups of brown rice, a tablespoon of olive oil and a cup of broccoli. That provides 109 grams of carbohydrates, about 60 grams of protein and 24 grams of fat." Mike doesn't beat up on dietary fat: "Unsaturated fats, especially olive oil, are essential. They help all kinds of functions in the body that affect growth. Plus, they're a dense source of calories, which is an important factor in adding weight." Vegetables are another must. "People think they're a diet food, but they're important because of their fiber content." Fiber helps cleanse the intestines, and some speculate this can increase nutrient absorption, yet another consideration in growth and tissue repair.